It has been rare lately that I’ve had a whole weekend just to relax. This past weekend was no exception and I needed to work late on Friday, but my husband and I still had it in our minds to make Saturday a wonderful day together and it was. 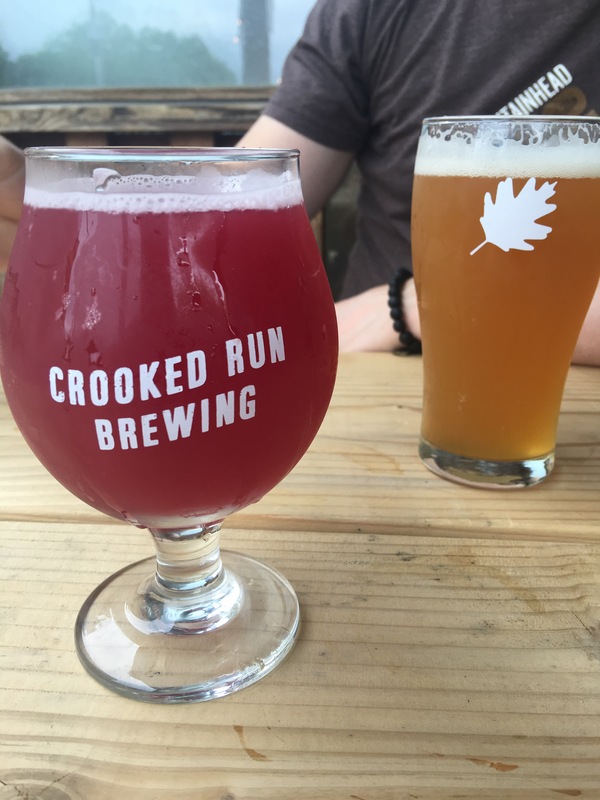 One of our favorite things about Leesburg is that it’s right in the foothills of the Blue Ridge Mountains, so it feels like a lifetime away from our quite urban suburb of D.C. The air feels fresher, the pace of life a bit slower. The BBQ was outstanding – and Josh was kind enough to humor me by going here since he’s been eating vegetarian since the beginning of the year. He did not miss out on their incredible sides. He piled up on some collards, coleslaw, cornbread and mac & cheese. The mac and cheese is so creamy, smoky and slap your momma good. They make it with gouda, y’all. It is to DIE for. The collards were something else! The coleslaw isn’t that mayo-ridden stuff you avoid at picnics – it’s vinegar based so it’s got a good amount of crisp flavor. It’s the perfect compliment to a messy sandwich. And if you’re a cornbread fan (and let’s face it, who isn’t?) you must try their cornbread. There’s a little surprise tucked inside – CUSTARD. And don’t you dare turn your nose up, it is MAGNIFICENT. 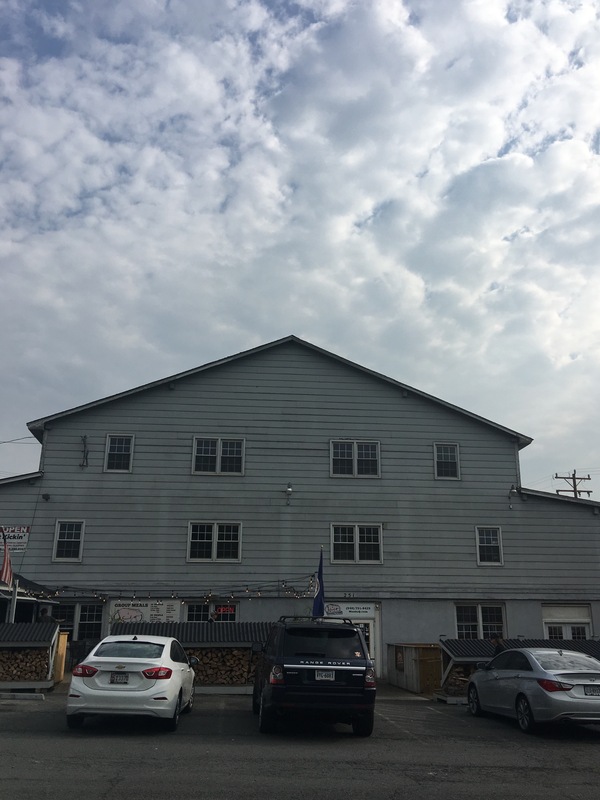 We left feeling pleasantly full and content, and drove to my parents’ house to pick up my tub of summer clothes. A recent humidity wave prompted me to change over my closet. I’ve been bagging up clothes that no longer fit, and getting rid of lots of stuff I don’t wear. I won’t lie, it is a struggle! However, cleaning out my closet to only have stuff I will wear is something I think I will really appreciate. It’s a large box bag for a knitting project. I used the tutorial from Truly Myrtle (I learned about this fabulous tutorial at Stitch.) Somehow, I always put my zipper tab in on the wrong side. This time I decided to go with it. The exterior fabric is from Emily Martin’s line for Birch. 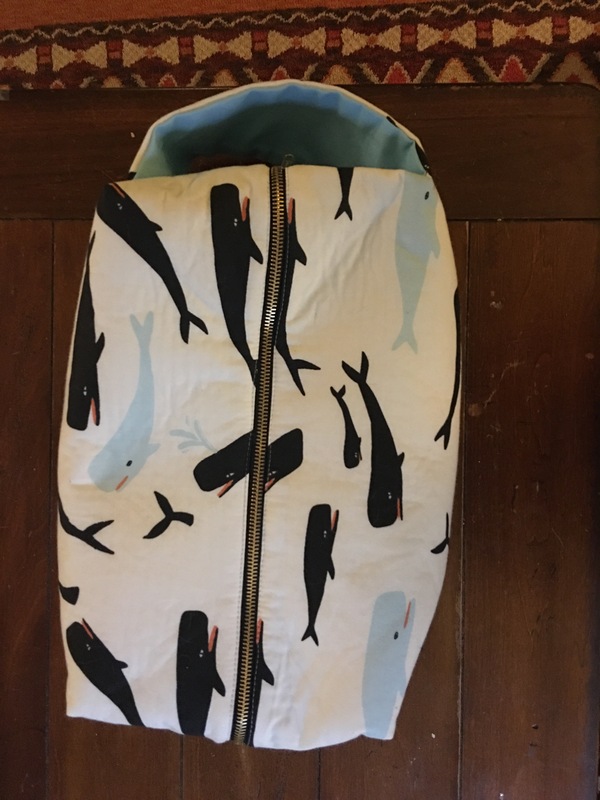 I am a sucker for anything with whales on it. The interior is just a Robert Kaufman solid. I love these box bags. Again, they would make a perfect present. This size is pretty large – but would make a great travel storage bag. I was thinking about stuffing it full of some baby items for a dear friend. Also for anyone who is a sweater knitter, this would hold many skeins plus instructions of whatever you’re working on. I’d love to experiment with adding a grommet for knitting on the go! 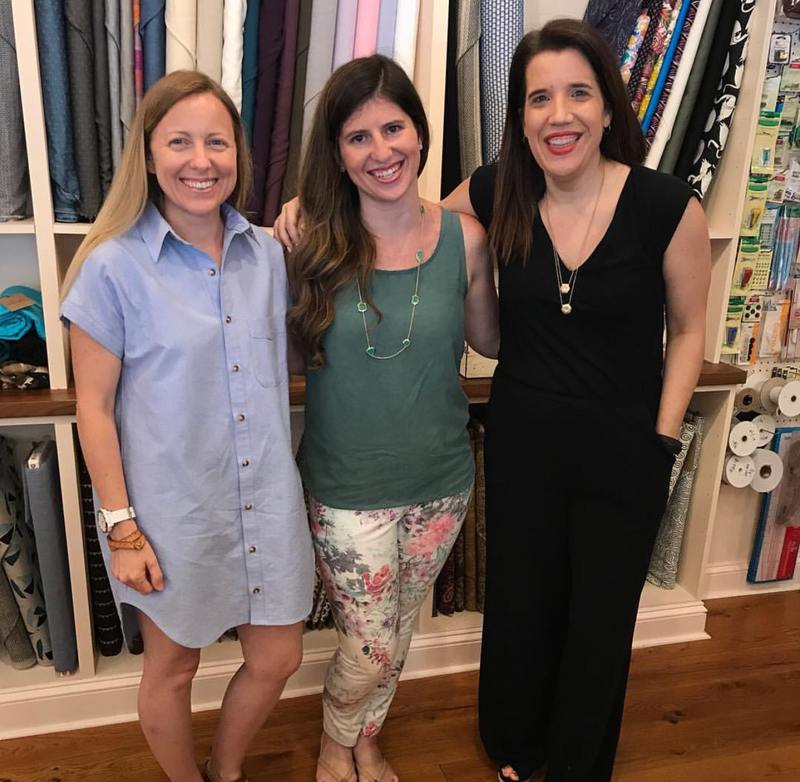 A few weeks back I signed up for a Sallie Jumpsuit class at Stitch Sew Shop. Kalle was kind enough to let me try her muslin on and I was immediately in love with the secret pajamas that were also surprisingly flattering. The pattern, like all of Heather’s patterns, was really well written. The construction of the Sallie Jumpsuit as ingenious. And, save for the cutting (which always takes me longer than it probably should) this is a pretty quick make. I actually love the Jumpsuit so much I wore it on my birthday. In the morning I went to Stitch and spent the day shopping for fabric (plus lunch with Lara). That night, I wore it out to dinner with my parents since hubs had to go out of town. I stole this photo from Lara– but it’s a perfect Closet Case Patterns fangirl moment. Our friend Jessamy is wearing the Kalle shirtdress (isn’t it perfect?). Lara is wearing floral Ginger Jeans (I am jealous of that flower power denim!) and I’m wearing the Sallie. The three of us were actually in the Sallie class together, so it was great to catch up at Stitch over the weekend. I loved the Jumpsuit so much that I wanted to make a dress! 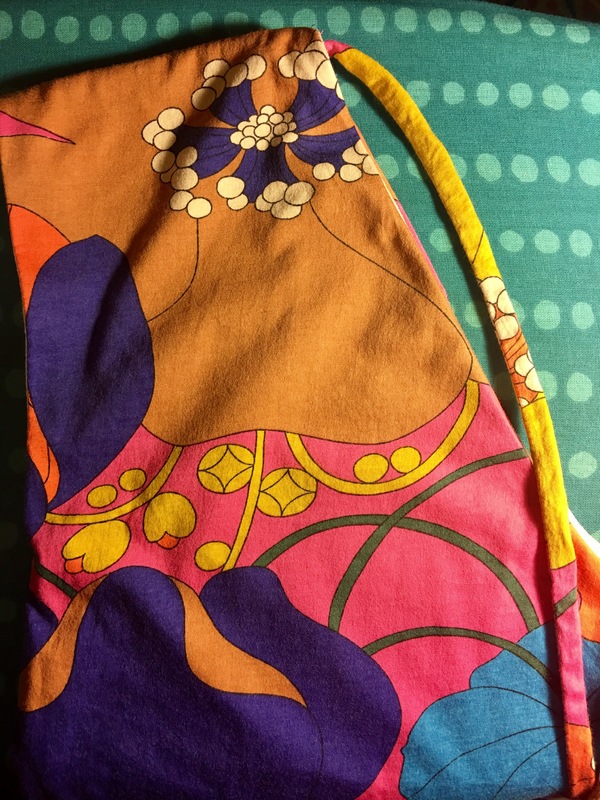 I bought this amazing and loud Pucci print from Stitch a few weeks back and it was perfect…save for the fact that it was a little narrow and I probably should have bought an extra half yard to handle the lining…I used a white light bamboo for the lining which worked out just fine. I probably should have picked something not so high contrast in case it peeks out. Here’s a sneak peek of my birthday dress version. I’ll post real pictures of it soon. With Josh out of town, I didn’t have a photographer this weekend. I have a feeling I will be making another Jumpsuit because it’s just too comfortable not to have more than one. I mean I have to have a back up for when one is in the wash…anyone else lazy when it comes to laundry? Is there a pattern you love that you make multiples of? Let’s talk about another pattern I get a LOT of mileage out of: the Petal Pouch by Noodlehead. When it comes to bags, Anna’s patterns are always HIGH on my list. 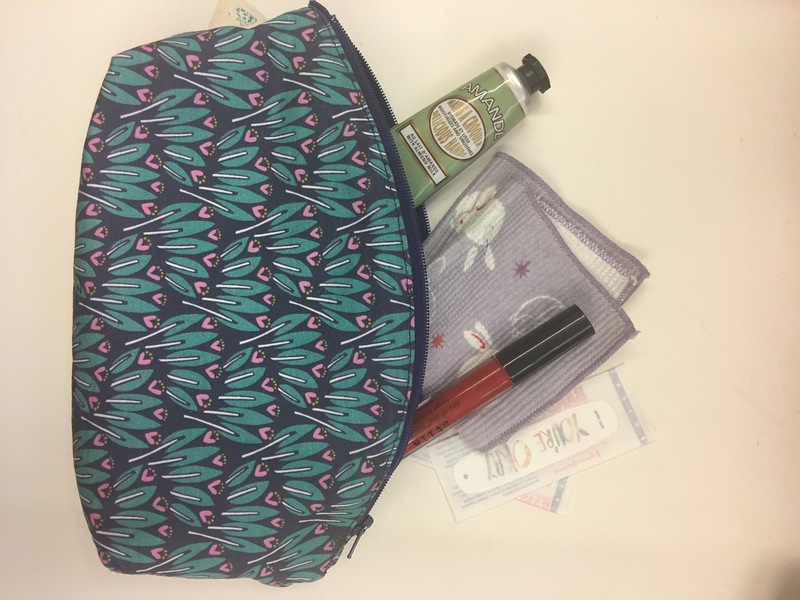 I always think pouches are really useful – and they make great gifts/reusable gift wrapping. In fact, I have a feeling that I’ll be gifting a bunch of these, and can imagine them with a pretty ribbon tied around them. But first I wanted to test the pattern out myself. The petal pouch in action: at work! 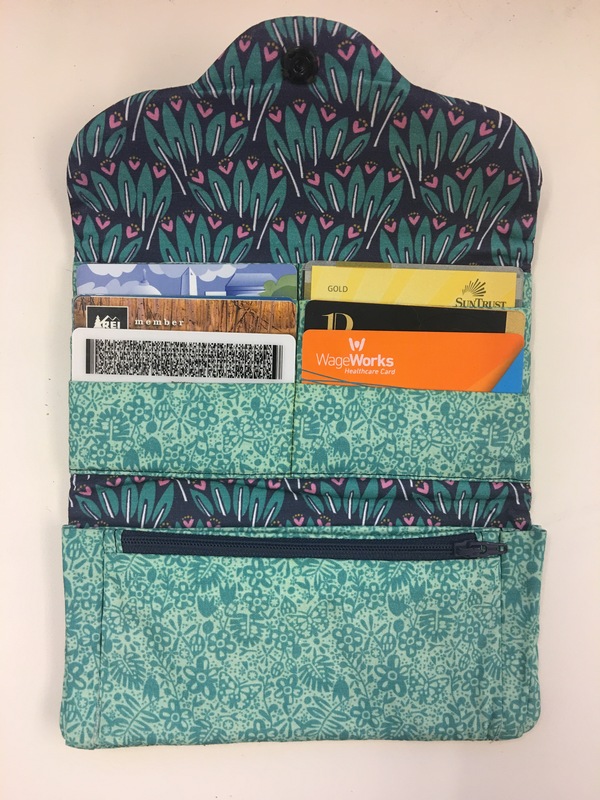 I used some leftover fabric for the exterior from my Have It All Wallet from Hawthorne Threads. It makes for a sweet matching set in my purse! The interior is some leftover Cotton + Steel I had from another favorite bag project. I made the large size pouch, and it has PLENTY of room. 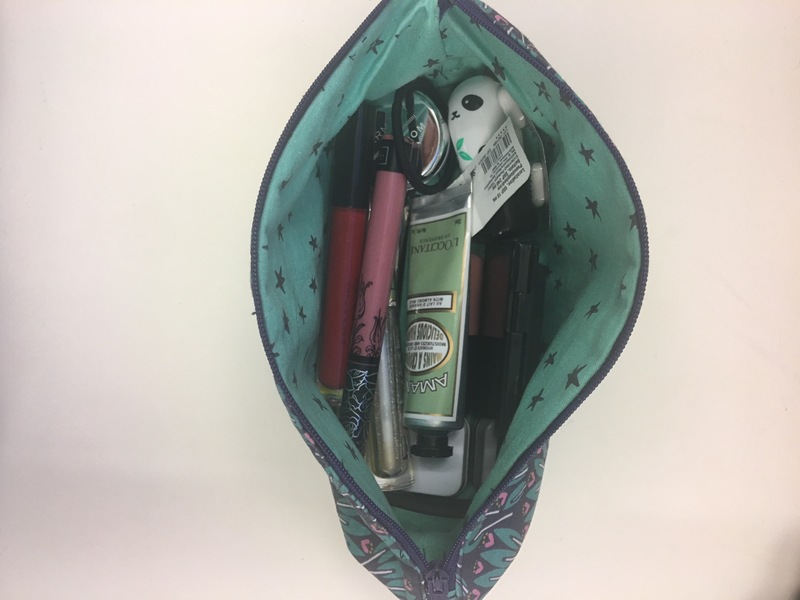 I am currently not making use of all of the space, but it would definitely have enough for a weekend away toiletries kit, or a tech pouch for chargers and the like. It’s a very useful size. My only alteration when I make this the next time? I might try to use an exterior fabric with a little more body – like a canvas (maybe even a waxed canvas?). I had also thought about using some fusible fleece to help it stand up a little more. I also might try my hand at a jeans zipper, because I love the heft of them and the gold teeth always add a bit of luxe to the look of pouches. The pattern is really well written. My stitching wasn’t perfect, but I’m okay with it as a first pass. My only major stumble was figuring out the darts, but I think that had more to do with my overnight working brain being a little sleepy. I’m participating in “Me Made May” – it’s an opportunity to showcase making garments and items yourself, instead of relying on ready-to-wear items. What I love about this is that when you make your own clothes or bags, you really understand the work that goes into them and you take care of them. You choose the materials, and I have found that this really helps me focus on making sure I use the fabric I buy effectively. If you want more info, you can read all about Me Made May in more detail here. One thought I had about Me Made May was to feature some of my makes that give me the most mileage. One of those has to be the Have it All Wallet by Oliver + S.
Ha. You can still see my yellow chalk pen marks! 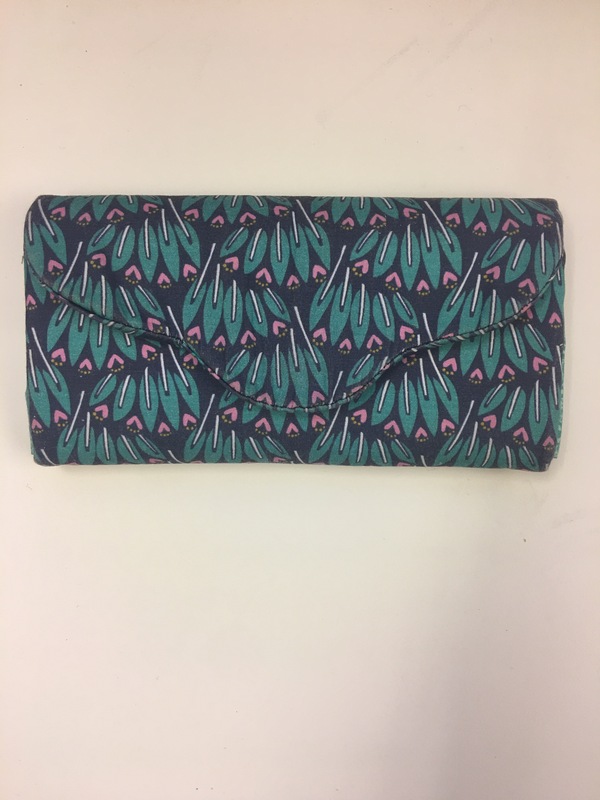 The pattern calls for use of heavyweight interfacing to give the wallet some body. I used some very stiff sewn in interfacing I found at Joann and I wasn’t wild about it. Firstly, my machine had a lot of trouble sewing through it. (I have a Bernina 560, and I think this interfacing needed a sharper needle) I wasn’t really able to troubleshoot this issue, because I still don’t have that much experience working with bags and interfacing so I just kind of winged it. The pattern also suggests toptstiching around the edge of the wallet. I love topstitching because it gives things that nice, professional, finished look but that was not going to happen with my machine so I left it out. 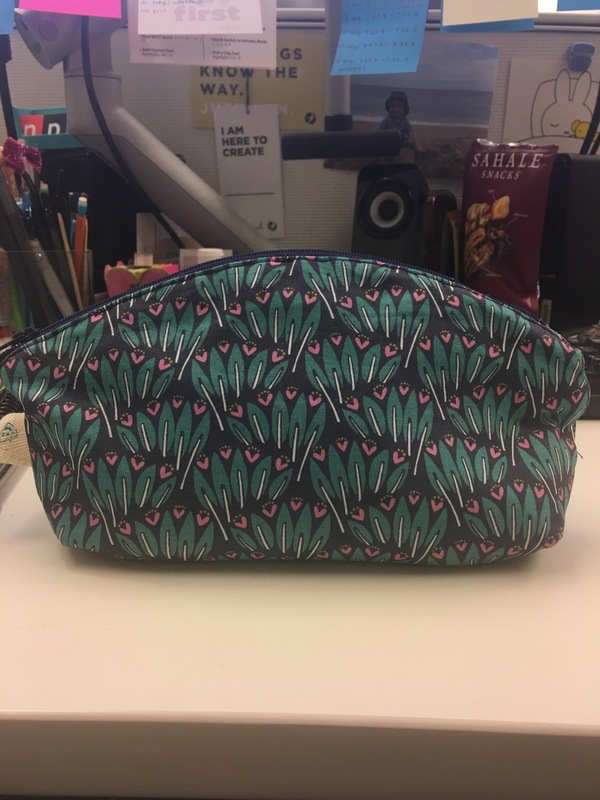 I really love how this turned out, and I smile every time I open up my purse to grab my wallet. My mom has always been very crafty. When I was a little kid my mom made almost all of the clothes my 2 brothers and I wore. She made matching outfits for my middle brother and I to visit her in the hospital after the birth of my baby brother. They were smocked. To this day, I still have no idea how she pulled that off. Moms are superheroes, y’all. So I come by the crafting bug very honestly, and somewhat stereotypically…. It was back in 2006 (maybe?) and I had just gone through a pretty traumatic breakup. I’ll spare you the details, but I was in my early 20s at the time so it felt quite traumatic. My mom was trying to suggest all kinds of things to distract me and the one that clicked was knitting. It was quiet, slow-paced and I could do it while I watched TV. (This was before the advent of Netflix binges, so I think I mostly watched stuff I TiVo’d) I fell in love immediately even though I was HORRIBLE! Oh, the number of uneven scarves I made! I think it took me ages to realize that the reason my scarves were curling inwards was because I was only knitting in stockinette. I look back on my early projects and the perfectionist in me sighs and shakes her head. I was learning to knit during the boom of knitting blogs – so there were lots of great resources. So in a short amount of time, knitting became my thing. I amassed a huge yarn stash. I went to fiber festivals. I made so many wonderful internet knitting friends. I joined ravelry. I got into photography (though I’m still terrible at it). I got better with each project. It’s taken me 10+ years though to figure out what I really like to knit. I’ve found through the years that I crave a good project with texture. 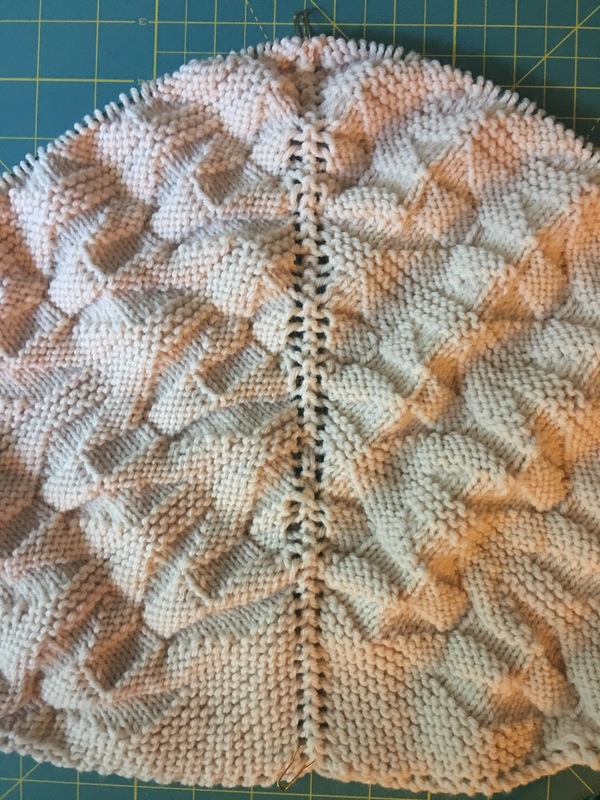 Lace isn’t really my thing (though I love a good scrunchy, worsted-weight lace-work shawl). I love the idea of sweaters but I’m too impatient generally to execute them. I really love a cozy, textured shawl. I feel like I’m taking a cue from those women who can instantly transform an outfit from simple to classic just by throwing on a shawl. I was on a quest for something like this recently and I stumbled upon Onward by Shannon Cook. I’ve been an admirer of Shannon’s work for a while, but somehow had never taken on one of her patterns. I love her aesthetic – it’s clean, cozy and classic. Her designs feel to me like ones that future generations of EmOs could wear with ease. 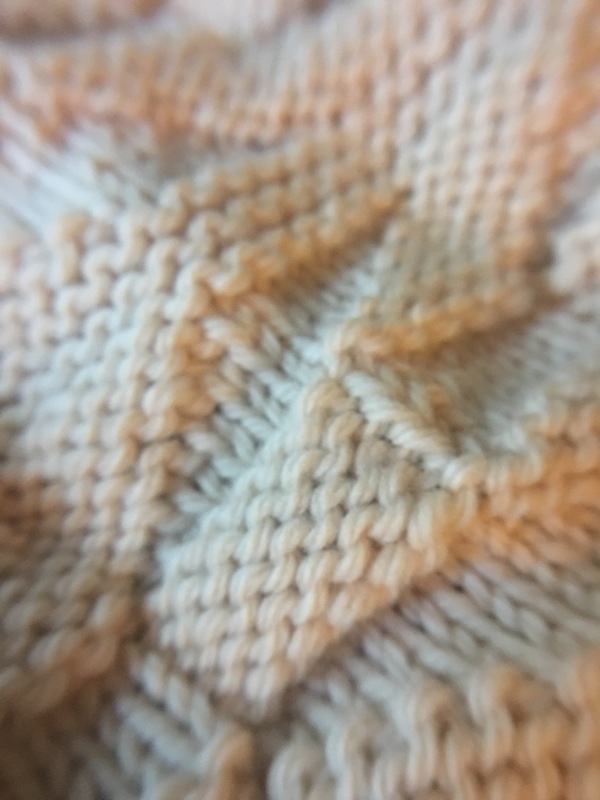 Onward is a lovely triangle-shaped shawl, worked from the top, outwards. It’s not quite Netflix binge-watching knitting, because I find I need to pay attention to my counting, but I like how each block builds on the previous block. The instructions are not charted and I know some people have strong feelings about this. I quite like it, because I feel like those who might not be accustomed to reading charts would have no problem picking up this knit. The yarn is Quince & Co Lark. And, wow, I had forgotten how delicious this yarn is! It’s springy and soft while being 100% wool. The colorway I chose is this palest of spring sunset pinks, called petal. I chose it because it felt like a great neutral pink. I could also see this as a perfect color for a sweet baby blanket. As you can see, I get great pop and stitch definition with Lark. I can’t wait to see this knitted up. Luckily, since it is worsted weight, I shouldn’t have to wait too long! I thought I’d try my hand at blogging because I love to write, and in the past year I’ve learned to love to sew. Just last year a make space opened up near where I live. Stitch Sew Shop has become my home away from home. I took a primer, and then took a class to make my very first garment in July 2016. After that garment, I was hooked. I bought my sewing machine in December from the lovely folks at Finch Knitting & Sewing Studio in Leesburg, VA. Ever since then I’ve been a making machine. Me, during a weekend workshop at Stitch! I’m a runner, sewist, knitter, reader, home chef, wife, dog mom and so much more. This corner of the world gives me the opportunity to share my efforts to put a little more beauty into my every day life.